Objective: The objective of this study is to investigate the clinical efficacy and safety of Habib™ VesOpen, a new intravascular radiofrequency ablation (RFA) catheter in percutaneous puncture of portal vein tumor thrombus (PVTT) in patients with primary hepatocellular carcinoma. Materials and Methods: Collected data of patients with primary hepatocellular carcinoma with portal vein trunk or main branch who were treated by the RFA of portal vein tumor ablation with Habib™ VesOpen, a new intravascular RFA catheter. The postoperative success rate, complications, liver and kidney function, alpha-fetoprotein (AFP), portal vein patency, and tumor thrombus were analyzed, and the survival status of patients was analyzed by Kaplan–Meier survival analysis, and the COX proportional hazards regression model was used to analyze the factors influencing the clinical prognosis of patients. Results: All the 44 patients were operated successfully without complications such as vascular perforation, infection, liver abscess, and intraperitoneal hemorrhage. The liver function index, alanine aminotransferase, aspartate aminotransferase, and serum albumin (ALB) were significantly different before and after surgery at 2 weeks and 4 weeks after operation (P < 0.05); AFP before and after surgery, the difference was statistically significant (P < 0.05). Doppler ultrasonography showed blood flow through the original portal vein after 4 weeks of surgery; enhanced computed tomography examination or magnetic resonance examination on the abdomen suggested patients with varying degrees of tumor thrombosis or disappearance after 8 weeks of surgery. The overall survival time was 284.72 ± 27.20 days (95% confidence interval: 231.42–338.02 days). The cumulative survival rates of 90, 180, and 360 days were 97.7%, 72.7%, and 17.2%, respectively. Cox multivariate regression analysis showed that tumor size and the size of ALB before RFA treatment was an independent factor in the prognosis of hepatocellular carcinoma with PVTT ablation (P < 0.05). Conclusions: The use of Habib™ VesOpen intravascular RFA catheter percutaneous puncture of the portal vein tumor RFA has positive clinical effect which is safe and reliable, expected to become one of the effective means in treatment of primary hepatocellular carcinoma with PVTT. Prognosis of primary liver cancer has been heavily influenced by its hidden characteristics, late treatment of patients, and invasion of portal vein forming the cancer thrombus. Primary liver cancer portal vein tumor thrombus (PVTT) has high incidence rate. Patients with liver cancer in the late stage are easy to form the tumor thrombus in the portal vein or the main branch. Even for the small liver cancer, the formation of tumor thrombi in the portal vein has relatively high proportion, which accounted for 40.0%–90.2%. PVTT affects the liver blood supply, further leading to deterioration of liver function, affecting the prognosis of liver cancer. Hepatocellular carcinoma patients with PVTT have an average survival time of 2.7–4.0 months. Its treatment is one of the problems faced by modern medicine. Radiofrequency ablation (RFA) is the use of electromagnetic waves at certain frequency (460–500 kHz) to destroy the diseased tissue in the organism, leading to instantaneous coagulation and denaturation of protein, and condensation, fragmentation, and dissolution of cell nucleus, causing irreversible necrosis of tumor cell., VesOpen catheter is a new type of intracavitary bipolar RFA catheter. It is structurally similar to the EndoHPB bipolar RFA catheter ablation of cholangiocarcinoma which effectiveness and safety have been confirmed by the reports. Forty-four cases of primary liver cancer with portal vein thrombosis patients had been analyzed, which went through the processes of the percutaneous transhepatic portal vein, VesOpen RFA catheter introduction, and the placement of ablation electrode in the PVTT for the ablation treatment. The clinical observation was reported as follows. Collected patients' cases which were diagnosed with primary liver cancer with portal vein thrombosis between January 2015 and December 2016 are in line with “primary liver cancer diagnosis and treatment” (Ministry of Health 2011 edition) clinical diagnostic criteria  and without surgical indications or unwillingness to undergo surgery. Inclusion criteria in this study were as follows: primary liver cancer with PVTT was diagnosed by B ultrasound, magnetic resonance imaging (MRI), computed tomography (CT), alpha-fetoprotein (AFP), or angiography; liver function Child-Pugh score was A or B level. Exclusion criteria from this study were as follows: patients had additional cholangiocarcinoma, diffuse type of liver cancer and liver metastases; patients had additional severe underlying diseases, including cardiovascular, respiratory, and so forth; and patients with extrahepatic metastasis and severe cirrhosis with ascites cases. Forty-four cases were eligible for case collection during the period between January 2015 and December 2016 including 39 males and 5 females whose age was around 29–72 years with mean age of 55.23 ± 10.02 years. All the selected patients' case had treatment of RFA and sequential transarterial chemoembolization (TACE). Before treatment, 6 cases had serum AFP <13.6 ng/mL (normal), 10 cases had AFP between 13.6 and 500.0 ng/mL, 9 cases had AFP between 500.0 and 1000.0 ng/mL, and 19 cases had AFP >1000 ng/mL. Among the collection, 33 cases had single tumor and 11 cases had multiple tumors. Nine cases had tumor diameter <5 cm, and 35 cases had diameter ≥5 cm. Thirteen cases had portal vein right branch tumor thrombus, 7 cases had left branch tumor, 14 cases had the right branch of the bolt to the trunk, and 10 cases had left branch tumor bolt extension to trunk. RFA catheter Habib™ VesOpen (EMcision Ltd., UK) is a bipolar radiofrequency catheter for percutaneous transhepatic use, with a diameter of 5F and a length of 1.1 m, used in conjunction with catheter sheaths with an internal diameter ≥2 mm and guidewire with a length ≤0.014 inch, entering into the target portal vein through guidewire. There are two 5-mm lengths of the ring electrodes at a distance of 8 mm at the distal end of the catheter which can produce focal coagulation necrosis with diameter ≤2 mm of. RF generator (1500 RF generator; RITA Medical Systems Inc, Fremont, Calif) has transmission power 10 W, frequency 450 kHz, and time 2–10 min. Step 1: Routine disinfection, shop towels, and local anesthesia. Step 2: percutaneous puncture of the portal vein under ultrasound guidance. Then, place 8F catheter sheath under the guidance of the digital subtraction angiography (DSA) perspective after successful puncture. Subsequently, along the 0.035-inch loach guidewire, 5F Cobra catheter or the vertebral artery is inserted into the splenic vein, or mesenteric vein angiography is used to clarify the location and extent of the tumor thrombus. Step 3: Change into the 0.014-inch superhard guidewire and introduce the Habib™ VesOpen catheter along the guidewire. The catheter electrode was sent to the tumor. The guidewire should be left in the tube of VesOpen and out of the top of the catheter 1 cm or 2 cm. Step 4: Connect the RF generator for ablation, usually 2 min per 20 mm ablation. Step 5: After the ablation of the evacuation of the radiofrequency generator, push the 5F angioplasty balloon catheter (Cook Company) to the tumor stenosis for balloon angioplasty to ensure 2 min balloon inflation, repeat once and then withdraw balloon catheter. 5F Cobra catheter is inserted into the splenic vein or superior mesenteric vein is used for the observation of portal vein recanalization. Step 6: If the portal vein recanalization is not satisfied, introduce the stent release system at the portal vein stenosis along the guidewire, and release the stent angiography confirmation (this group of patients with 12 cases of intraoperative stent implantation). Step 7: Finally, slowly pull out the catheter, and cover the puncture site with pressurization. All selected patients were accepted sequential TACE treatment of intrahepatic tumors. Review of liver function (alanine aminotransferase [ALT], aspartate aminotransferase [AST], serum albumin [ALB]), renal function [blood urea nitrogen (BUN) and creatinine (CR)], and AFP was performed at before surgery, 2 weeks after surgery, and 4 weeks after surgery, respectively. At 4 weeks after operation, portal vein Doppler ultrasonography was performed. After 8 weeks, the upper and lower abdomen was examined by enhanced CT or MR examination to evaluate whether the portal vein was smooth and the tumor thrombus was changed. Starting point of survival time was defined as the date when patients received endovascular catheter ablation calculated in units of days. The end event was the patient died of cancer, and the censored data were tumor-independent death. Professional staffs were responsible for follow-up which had monthly telephone follow-up once. The follow-up date of termination was June 30, 2017. SAS version 9.2 software (SAS Institute, Inc., Cary, North Carolina) was used to deal with the data. Normal distribution of the measurement data was expressed as x¯ ± s. Median(Interquartile range) (M[IQR]) represented nonnormal distribution of data. AF P values took logarithmic transformation, ALT and AST used the square root transformation, and data were transformed into normal analysis for further statistical analysis. The differences in the parameters were measured using the variance analysis of repeated measurements at before surgery, 2 weeks after surgery, and 4 weeks after surgery, respectively, and the least significant difference-t-test was used for comparison. 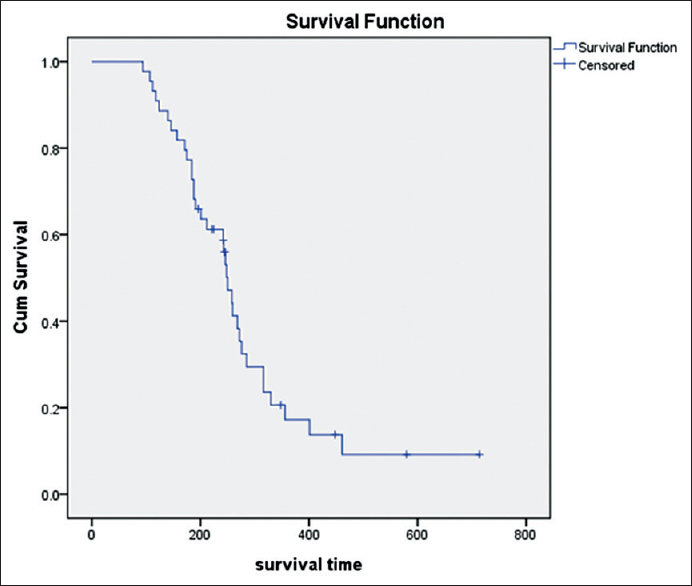 Kaplan–Meier survival analysis was used to analyze the survival time of the patients and the survival function curve was drawn. The Cox proportional hazards regression model was used to analyze the factors that affected the clinical prognosis. The test level is α = 0.05. Forty-four patients were successfully completed treatment. After surgery, patients did not occur vascular perforation, infection, liver abscess, abdominal bleeding, and other surgical-related complications but a brief puncture area pain. The changes of liver function indicators such as ALT, AST, and ALB before and after surgery were statistically significant. There was no significant difference in the changes of renal function index BUN and CR before and after operation, and the changes of tumor index AFP before and after operation were statistically significant. Further analysis showed that the postoperative liver function was transiently injured and recovered slowly after 4 weeks of surgery. AF P value decreased rapidly after surgery. Renal function indicators such as BUN and CR values decreased, but the change is not obvious [Table 1]. Immediate portal vein angiography showed portal venous flow velocity were significantly increased in the 44 liver cancer patients with PVTT after RFA treatment [Figure 1]. Doppler ultrasound showed the original portal vein blood flow through the block 4 weeks after the surgery. Eight weeks after surgery, enhanced CT or MR examination on the abdomen showed that 31 patients with varying degrees of tumor thrombus, and 13 patients with tumor thrombus disappeared [Figure 2]. The average survival time of patients was 284.72 ± 27.20 days (95% confidence interval [CI]: 231.42–338.02 days). The cumulative survival rates of 90, 180, and 360 days were 97.7%, 72.7%, and 17.2%, respectively. The median survival time was 250.00 ± 10.10 days (95% CI: 230.20–269.80 days). By Cox multivariate regression analysis, the size of the tumor and the value of the ALB before RFA treatment were independent factors (P< 0.05) in the prognosis of patients of hepatocellular carcinoma with PVTT (P< 0.05) [Table 2] and [Figure 3]. Intravascular catheter RFA combined with balloon dilatation for PVTT local recanalization is a new method for the treatment of PVTT, which is rarely reported. At present, nonsurgical treatment of primary liver cancer with PVTT common methods is TACE plus three-dimensional conformal radiotherapy,125 I radioactive particle implantation, or portal vein stent implantation  and so forth. However, there is not an effective and feasible method to treat PVTT successfully due to the long particle onset time and high blocking rate after portal vein stent implantation. In this study, the Habib™ VesOpen bipolar RFA catheter was designed to kill the tumor cells by heating and to form a cylindrical necrotic area in the portal vein area, which played a role in opening the portal vein., In this group, after using intracavitary catheter RFA for the patients with PVTT, immediate portal vein angiography showed the improvement of hepatic portal vein blood flow. Forty-four patients were followed by sequential TACE treatment of intrahepatic tumors, and no significant intraoperative and postoperative complications were found. Doppler ultrasonography showed blood flow of original blocked portal vein 4 weeks after surgery, and enhanced CT or MR examination on the upper abdomen illustrated significantly reduced tumor thrombus and its part was even disappeared. In line with the Mizandari et al. study, six patients who were not surgically resected were enrolled in the study where RFA catheters were ablated successfully, and the tumor thrombus was ablated. After treatment, DSA showed a significant improvement in portal vein blood flow. Postoperative Doppler imaging showed significant recovery of hepatic blood flow, improved hepatic function, reduced portal vein tumor, and no adverse events associated with catheter ablation, indicating that percutaneous portal vein tumor thrombus ablation treatment was safe and feasible. Compared with conventional nonthermal balloon angioplasty, the area of peripheral arterial cross-sectional area is significantly increased and the ablation catheter can be safely used for vascular remodeling to achieve greater intracavitary diameter and blood flow, which is confirmed in animal studies. Thanos et al., on the liver cell carcinoma caused by PVTT direct RFA, found that 16 months after ablation of the portal vein remained patency. Intravascular catheter RFA mainly uses the high-frequency alternating current to cause the intracellular ion to move in the opposite direction quickly. The frictional force generated by the ionization movement produces heat evenly in the tissue around the catheter and the electrode so that the tissue of the region is condensed. Intravascular catheter RFA combined with balloon dilatation for PVTT has the following advantages: (1) damaging the tumor thrombus and prevent or delay the spread of the disease; (2) improving liver function so that patients have the possibility of receiving TACE or surgical resection; and (3) reducing the portal vein pressure, thereby reducing the possibility of esophageal variceal bleeding. In recent years, intravascular catheter RFA has been gradually applied to patients with liver cancer with PVTT treatment. Primary liver cancer with PVTT had certain damage to liver function that ALT and AST were higher than normal (0–40 μ/L), and ALB was lower than normal (40–55 g/L). Postoperative liver function indicators improved, consistent with Giorgio et al. reported. Renal function indicators such as BUN and CR detection values were at normal levels which had no significant changes (BUN normal: 2.88–7.14 mmol/L, CR normal: 44–133 mmol/L). Postoperative AFP indicators decreased significantly compared with preoperative, suggesting that patients with intracavitary catheter RFA and TACE, to a certain extent, reduce the liver and kidney function of patients so that patients with liver function to be restored in a short time. Primary liver cancer with PVTT patients had overall poor prognosis; the median survival time was short. In the treatment of late-stage cancer patients, palliative care is dominant to improve patient's quality of life. Therefore, the treatment of PVTT is useful to prevent disease progression, relieving clinical symptoms. Zhang et al. retrospectively analyzed 58 cases of percutaneous transhepatic portal venoplasty and stenting (PTPVS) combined with TACE in patients with liver cancer with PVTT. The median survival time was 113 ± 27 days, and the cumulative survival rates were 74.1%, 27.1%, 17.2%, and 13.8% for 2 months, 6 months, 1 year, and 2 years, respectively. Similar to the results of this study, 90, 180, and 360 days' cumulative survival rates were 97.7%, 72.7%, and 17.2%, respectively, but the median survival time was different being 250.00 ± 10.10 days (95% CI: 230.20–269.80 days) which might due to the tumor staging and the patient's own condition and so on. The study found that tumor size and ALB values before treatment were independent factors on prognosis of hepatocellular carcinoma with PVTT after RFA. Tumor size affects tumor infiltration, because the greater the tumor is, the higher the chance of intrahepatic metastasis and vascular infiltration is, resulting in decrease of the survival rate of patients. Feng and Xi Tao, exploring the 917 cases of liver cancer patients with the relationship between the general PVTT and tumor diameter, considered that 5 cm is the dividing line where liver cancer is easy to invade the portal vein, and PVTT combined rate was significantly higher when tumor diameter >5 cm. The treatment of primary hepatocellular carcinoma with PVTT through the use of Habib™ VesOpen intravascular RFA catheter percutaneous portal vein thrombus RFA combined with TACE is effective, safe and has low incidence of complications. Meanwhile, the study found great improvement of the patient's cumulative survival rate who received this treatment. This treatment method has a certain clinical effect , and is expected to become one of the effective means in the clinical treatment of primary liver cancer with PVTT. The limitations of this study are as follows. First, the sample size was too small. Second, control group had not been set up. Third, the follow-up time was relatively short. A large sample of randomized controlled trials with 5-year follow-up time will be conducted to further confirm the findings in the future. Hou YF, Wei YG, Yang JY, Wen TF, Xu MQ, Yan LN, et al. Combined hepatectomy and radiofrequency ablation versus TACE in improving survival of patients with unresectable BCLC stage B HCC. Hepatobiliary Pancreat Dis Int 2016;15:378-85. Lin ZY, Li GL, Chen J, Chen ZW, Chen YP, Lin SZ, et al. Effect of heat sink on the recurrence of small malignant hepatic tumors after radiofrequency ablation. J Cancer Res Ther 2016;12:C153-8. Changyong E, Wang D, Yu Y, Liu H, Ren H, Jiang T, et al. Efficacy comparison of radiofrequency ablation and hepatic resection for hepatocellular carcinoma: A meta-analysis. J Cancer Res Ther 2017;13:625-30. Steel AW, Postgate AJ, Khorsandi S, Nicholls J, Jiao L, Vlavianos P, et al. Endoscopically applied radiofrequency ablation appears to be safe in the treatment of malignant biliary obstruction. Gastrointest Endosc 2011;73:149-53. Ministry of Health of the People's Republic of China. Primary liver cancer diagnosis and treatment standards. J Clin Oncol 2011;16:929-46. Yamada K, Izaki K, Sugimoto K, Mayahara H, Morita Y, Yoden E, et al. Prospective trial of combined transcatheter arterial chemoembolization and three-dimensional conformal radiotherapy for portal vein tumor thrombus in patients with unresectable hepatocellular carcinoma. Int J Radiat Oncol Biol Phys 2003;57:113-9. Wei S, Yilong M, Chang Z, Shengqiu OU. TACE combined with radioactive 125I particle implantation in treatment of primary liver cancer with portal venous tumor emboli. Chinese Journal of Interventional Imaging and Therapy 2016;(9):526-9. Yamakado K, Tanaka N, Nakatsuka A, Matsumura K, Takase K, Takeda K, et al. Clinical efficacy of portal vein stent placement in patients with hepatocellular carcinoma invading the main portal vein. J Hepatol 1999;30:660-8. Zhang L, Jin-xin FU, Song P, Yuan K, Yan J, Duan F, et al. The safety of Habib VesOpen bipolar radiofrequency ablation catheter used in the treatment of portal vein tumor thrombus: An experimental study in miniature pig models. Journal of Interventional Radiology 2015;(6):515-9. Wu TT, Li HC, Zheng F, Ao GK, Lin H, Li WM, et al. Percutaneous endovascular radiofrequency ablation for malignant portal obstruction: An initial clinical experience. Cardiovasc Intervent Radiol 2016;39:994-1000. Mizandari M, Ao G, Zhang Y, Feng X, Shen Q, Chen M, et al. Novel percutaneous radiofrequency ablation of portal vein tumor thrombus: Safety and feasibility. Cardiovasc Intervent Radiol 2013;36:245-8. Lazoura O, Zacharoulis D, Kanavou T, Rountas C, Katsimboulas M, Tzovaras G, et al. Anovel experimental animal model of arterial stenosis based on endovascular radiofrequency energy application. J Invest Surg 2011;24:123-8. Thanos L, Sotiropoulou E, Tanteles S, Pomoni M, Kelekis D. Direct radiofrequency ablation of portal vein tumor thrombus in continuity with hepatocellular carcinoma. J Vasc Interv Radiol 2010;21:285-8. Giorgio A, Di Sarno A, de Stefano G, Farella N, Scognamiglio U, de Stefano M, et al. Hepatocellular carcinoma with cirrhosis: Are patients with neoplastic main portal vein invasion eligible for percutaneous radiofrequency ablation of both the nodule and the portal venous tumor thrombus? AJR Am J Roentgenol 2009;193:948-54. Zhang XB, Wang JH, Yan ZP, Qian S, Liu R. Hepatocellular carcinoma invading the main portal vein: Treatment with transcatheter arterial chemoembolization and portal vein stenting. Cardiovasc Intervent Radiol 2009;32:52-61. Zhou L, Rui JA, Wang SB, Chen SG, Qu Q, Chi TY, et al. Factors predictive for long-term survival of male patients with hepatocellular carcinoma after curative resection. J Surg Oncol 2007;95:298-303. Feng X, Xi Tao SF. Analysis on postoperative prognosis and the distribution of the resection of liver cancer patients with portal venous tumour emboli. Theory Pract 2004;4:278-81. Giorgio A, Calisti G, Montesarchio L, Scognamiglio U, Matteucci P, Coppola C, et al. Hepatocellular carcinoma invading portal venous system in cirrhosis: Long-term results of percutaneous radiofrequency ablation of both the nodule and portal vein tumor thrombus. A case control study. Anticancer Res 2014;34:6785-90. Yu TZ, Zhang W, Liu QX, Li WH, Ma JQ, Zhang ZH, et al. Endovascular brachytherapy combined with portal vein stenting and transarterial chemoembolization improves overall survival of hepatocellular carcinoma patients with main portal vein tumor thrombus. Oncotarget 2017;8:12108-19.